1 Begin by getting your pan nice and hot over medium heat. Pour some oil and throw in the onion and garlic. Cook until the onion is soft and the garlic is golden brown. 2 Gently add the kalabasa and sitaw and pour in the dissolved Knorr Complete Recipe Mix and siling haba. Stir well and cover until the vegetables are half cooked. 3 Throw in the shrimps and then continue to simmer until kalabasa and shrimps are fully cooked. And there you have it! 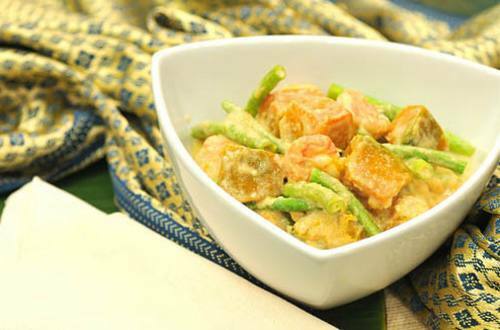 4 Ginataang Gulay is the perfect complement to any of your favourite dishes. You can simply have it as is. Like home, it’s a comfort dish!